My husband and I were talking the other night about life and winter with four kids, about parents in transition and crisis, about waiting on pins and needles and credit-cards for our much needed tax refund. 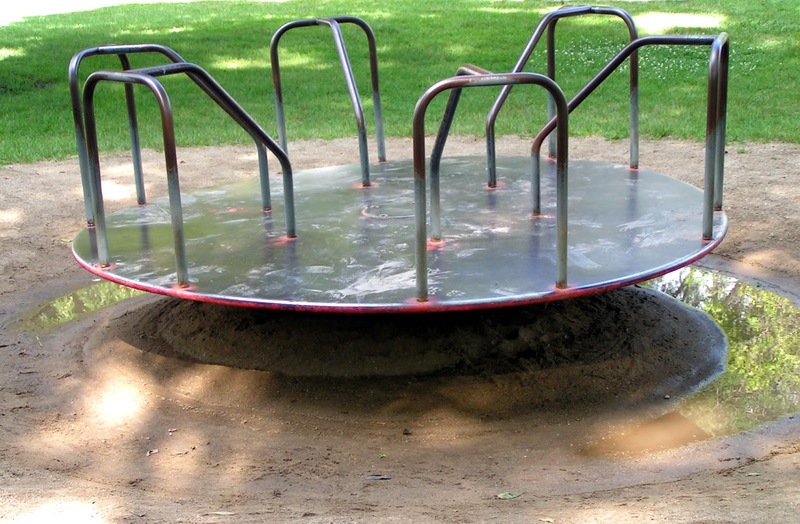 I can remember the under-side of the merry-go-round so clearly, the center post around which it all spun, the way the ground sloped out away from the post to the ditch worn by running feet. You never lost your footing all at once, but instead started leaning hard, too hard. Soon your upper body was too far out in front of your legs and when you finally fell your shoulder slammed into dirt, old leaves, and mud. The kids behind and in front of you kept running and it took a few seconds that felt like minutes for your brain to send the message to your hands that right about now would be a good time to let go. We felt a little better then, having named the feeling and paired it with a picture. Nothing was solved, no weight lifted, but at least we had another angle, an image between us, that gave expression to the experience. There’s a certain kind of grace, I guess, in knowing where you stand or, rather, lay. There’s some comfort too in solid ground, if you can manage to not get trampled; comfort in lying there, still, as your breathing slows. As you press your back into the ground you're held by that to which we shall all one day return. Looking up, the sky opens, wide. This reminds me that it is also really good to have someone to share the image with and especially someone that understands exactly what you are saying/thinking. Now that is a blessing. You're right Dad, a blessing that's too easy to overlook at times. your words are deep waters, friend. you say so many things with so few. love to visit here. every.time. Thanks so much Kelli, I'm glad to be connecting with you and finding you on various posts around the web.